Poor survey practices have earned surveys a reputation as spam. I've written about this before, though here I would like to highlight how respondents are often abused. Unfortunately, these crimes against respondents are largely committed not by the do-it-yourself inexperienced survey writers, but by established companies and professional respondents who simply should just know better. Case in point, I took a survey the other day which looked like it could be an interesting brand study. A screenshot of the survey page is included here. I've removed any obvious logos and links that would identify who was conducting this survey, though if you look closely, it shouldn't be hard to figure it out. This survey is a prime example of a poorly designed survey that simply abuses the respondent. 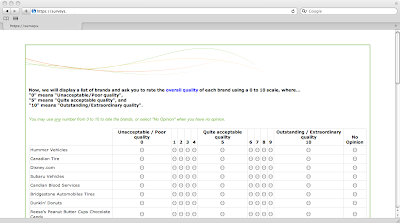 The survey requested the user to rate a series of brands across a number of items. In total there were 42 brands listed in each question, and there were at least 10 questions where the respondent had to rate each and every brand. Doing the simple math, this means for a respondent to complete the survey, it would require at minimum 420 clicks. Wow. To make matters worse, every question was forced. Shame on you. How can any research house expect a respondent to endure through 400+ clicks in a survey, and the reward being survey points. As a result of this experience and in an attempt to help make the world a better place, I'm including a few basic best practices for respecting the respondent. The goal in the industry should be to foster a fun and safe environment for survey respondents, after all, without respondents the industry would be a bit boring.